We always go to a pumpkin patch and of course carve pumpkins and roast pumpkin seeds. We have a Halloween movie marathon where we watch a Halloween/scary movie every night leading up to Halloween. And by golly this Ghoulish Grub Week, and all the treats that are associated with it, has become well know amongst my friends and family. As soon as October 1st rolled around, Eric immediately started asking about Ghoulish Grub Week and said he wanted Halloween treats to enjoy while watching our favorite Halloween movies. Then at a recent family gathering I brought these Monster Munch Cookies and these adorable Mummy Nutter Butter Cookies and Pumpkin Oreo Cookies. Everyone oohed and aahed over how cute these were and mentioned how they remembered similar cookies I did in the past. 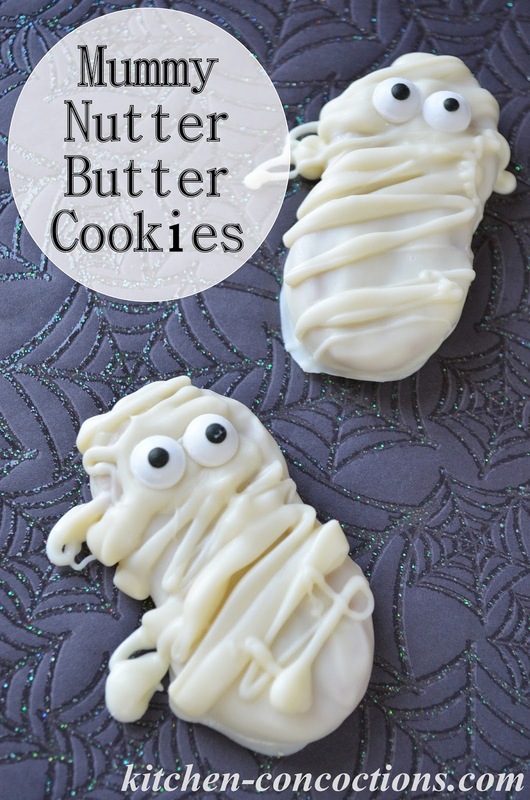 These Witch Finger, Goblin Feet, Eyeball and Ghost Nutter Butter Cookies have all been popular treats in the past. And I found out at the family dinner, totally a family favorite, loved by all! These new versions are equally adorable (although my little nephew thought they still looked like ghosts, oh well…) and were the first treat to go! 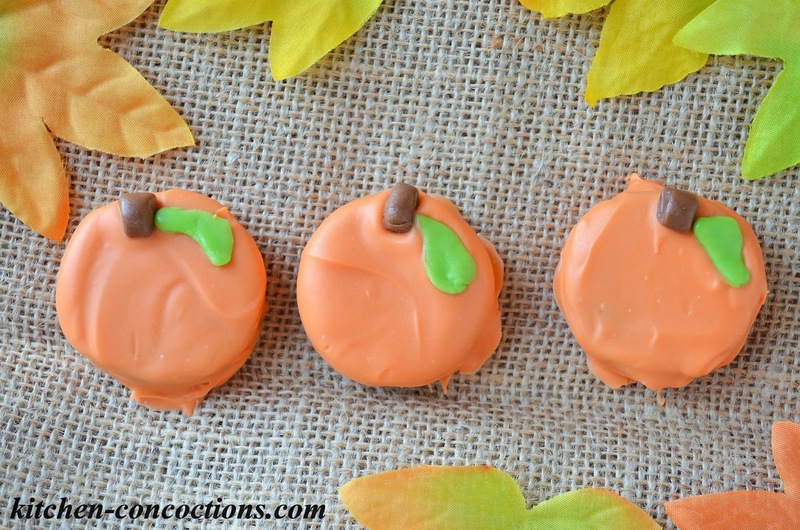 Chocolate dipped Oreos and Nutter Butters are so easy and fun (check out all my tips to create perfectly dipped cookies here!). 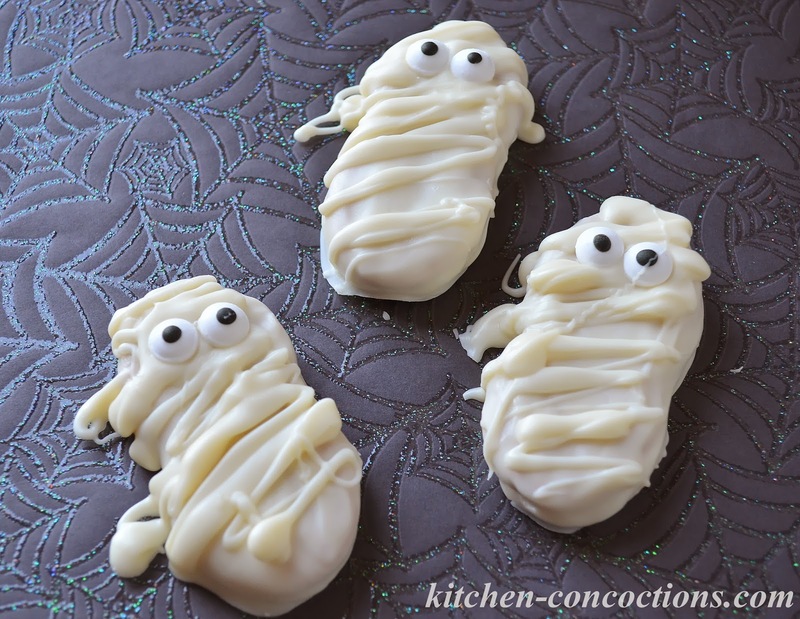 Even though this is the last Halloween recipe this year as part of Ghoulish Grub Week, I have many other Nutter Butter ideas for various other holidays and can’t wait to start creating! Place white chocolate in microwave safe bowl. Add ½ teaspoon of oil for every 6-9 ounces of white chocolate. Microwave for 30 seconds. Remove from microwave and stir. Return to microwave for an additional 30 seconds. Stir again and repeat heating and stirring process until chocolate is smooth and melted. Using a fork, working with one cookie at a time, dip the entire Nutter Butter cookie in melted chocolate. Allow excess chocolate to drip off. 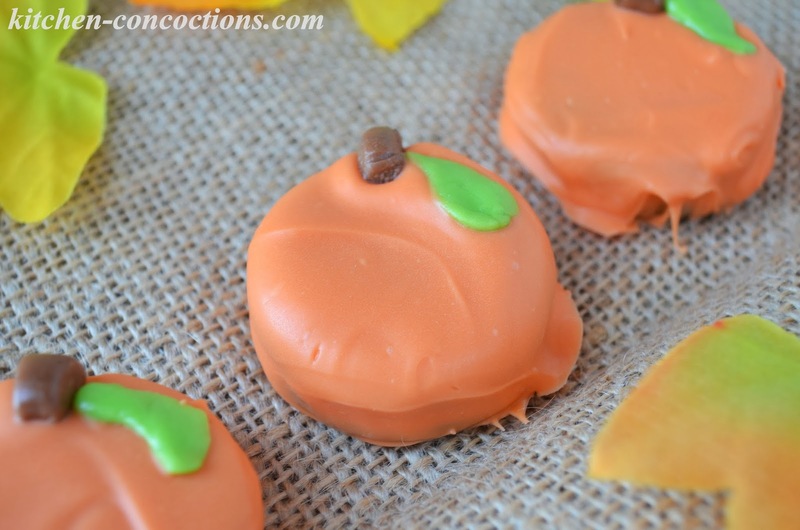 Place dipped cookies on wax paper lined baking sheet. Drizzle additional white chocolate over cookie. Do this using the fork or spoon some melted white chocolate into a piping bag with a round tip. Place two candy eyeballs on cookie. Set cookies aside to harden completely before serving. To speed up hardening process, dipped cookies can be place in refrigerator.